You can expect symptoms of extreme fatigue, depression, and restlessness during the acute phases of cocaine detox. How long do they last and how can these symptoms be treated? We review here. Cocaine detox is different than many other drug detox experiences. Because cocaine is water-soluble, it disperses through and out of the user’s body quickly. Just as a relatively short lived high is delivered to the brain, cocaine does not tend to stay in the user’s body very long. However, what happens when you become physically dependent on cocaine? 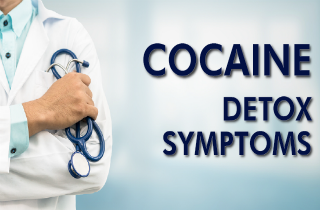 We review common symptoms of cocaine detox and their duration here. Then, we invite your questions about cocaine withdrawal in the comments section at the end. In fact, we try to respond to all questions personally and promptly. Cocaine is a powerfully addictive drug and regular user can begin to experience tolerance to the euphoric high it produces after regular use. Cocaine is psychologically addictive as well as physically addictive. The short duration of effects is one reason people use it over and over again. As effects wear off, people use more cocaine to try to [and are never able to] achieve the initial high…and a pattern of repeated use occurs. Cravings for cocaine and depression can last for months following cessation of long-term heavy use (particularly daily). These symptoms are triggered by low levels of serotonin and dopamine in the system and are sometimes treated with short term prescription of antidepressants. As the “high” associated with ongoing use becomes less and less pleasant, it can produce fear and extreme suspicion rather than joy (euphoria). Just the same, the cravings may remain powerful. Time is usually what people need in order to achieve internal balance after regular use of cocaine. Note here that withdrawal symptoms may also be associated with suicidal thoughts in some people. Suicidal thoughts should be taken seriously, and a person referred to a psychiatrist or psychologist for professional help. Following binge use of cocaine, the “crash” can last from nine (9) hours to four (4) days. Acute cocaine detox after a period of physical dependence can lasts for about a week. Post-acute withdrawal symptoms (PAWS) for cocaine, however, can last for months or even one year after last use depending on frequency and dosing of cocaine. PAWS can include problems sleeping, feelings of depression, and cravings. Breaking the binge/crash cycle is perhaps the most difficult part of the early phases of detox. The extreme craving that occurs after an intense crash begins to decrease after 3-4 days, so if the individual can get past that period of time, they are more likely to stay abstinent. How can you address these issues? Psychological treatments are really all we have to deal with cocaine detox symptoms at the moment, but can help if you stick with them. Emotional, psychological, and group support can be essential during cocaine detox. Keep in mind that symptoms usually resolve over time. 1. Euphoria blockers – For the prevention of relapse, medications that block cocaine euphoria or reduce cocaine craving have shown promise. 2. Propranolal – For cases of severe addiction, propranolol may be helpful in promoting an initial period of stable abstinence. 3. Relapse prevention medications – Potential relapse prevention medications include GABAergic medications, such as baclofen, tiagabine, and topiramate, and the glutamatergic medication, modafinil. 4. Vaccine – A vaccine capable of stimulating the production of cocaine specific antibodies has shown promise in preliminary studies for the prevention of relapse to cocaine use. People who experience cocaine detox may think that alcohol, sedatives, hypnotics, or anti-anxiety medications such as diazepam (Valium) or lorazepam (Ativan) can treat their symptoms. Use of these drugs is not recommended because it simply shifts addiction from one substance to another. Still have questions about cocaine detox or its symptoms? Please share your thoughts on this topic in the section below. We want to make sure that you are informed and prepared for a positive life change. So, we try to answer all questions personally and promptly. Hi Nicki. Call the helpline you see on the website to get in touch with a trusted treatment consultant. How much cost the treatment? Hello Tanya. The cost of detox can vary greatly from one facility to the next. Please call 1-877-649-8356 to get more info about cocaine detox treatment options, cost, and financing. It’s a toll-free, confidential line, with professionals standing by 24/7 to take your call. Just tried it the for the first time 2 months ago. Im going thru a rough divorce and haven’t seen my babies in 2 weeks due to trying to make sure this divorce doesn’t hurt them as much as us adults. I had a mental break down and asked a very good and close friends to help me feel better and usually weed is my go to however, at that point it wasn’t helping so “coke” came up in conversation and I was told I can try it but if I start wanting more and more ill be cut off. Well I have been wanting more and more of it… The cravings aren’t horrible but when I feel crappy or bad day and just knowing jets available calms me down quite a bit. I have only done it for maybe 2 weeks. Not seeing my kids is wearing me down and this isn’t the way to handle it. I’ve never touched anything besides this and weed. Just makes me happy and the worries fade for 15 20 min then I feel like I need more but becAuse its being regualted my my friend I do get antsy and irritable.. Cold sweats and helplessness. Im almost 30 years old and feels like im spinning outta control and not making my kids priority like they should be. I just want to be a better person, stronger for my 3 babies and myself! Hi Nikki. I suggest that you call the helpline on the website to speak with a trusted treatment consultant.